Reiki Drumming for healing and meditation is an ancient practice. In tribal cultures the power of sound over the body and spirit is well known, and now in the western world there is research supporting this – making this ancient wisdom more palatable to modern minds. Research shows that brain activity is affected by drumming, and there are studies showing how the sounds of a drum can help with illness and emotional trauma. Group drumming has been linked with improving the immune system, helping Alzheimer’s patients, building self esteem, and supporting recovering drug addicts and alcoholics. These studies are hinting at what has been known by shamanic practitioners over the ages, and shamans today still know as they practice what is often known as medicine drumming. Courses are held at The Clophill Centre, Clophill, Bedfordshire, a venue that has the use of a treatment/healing space, an Indian Tipi, underground meditation chamber and acres of grounds – a perfect space for this Reiki Drum Master Practitioner Course. Master Teacher Courses are held at Sipala in Aspley Guise, Woburn, Bedfordshire. 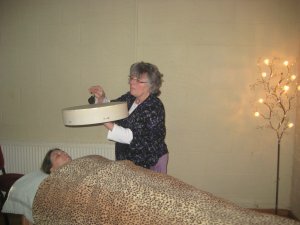 The fee for the Reiki Drum Technique Course is £280, with a £150 deposit paid in advance, and the balance paid to Cathy Birkinhead on the day of your course. Once you’ve been on your Reiki Drum Technique Master Practitioner course we want you to know that your teacher will be on hand to deal with any questions or queries that you might have. “Thank you for a wonderful drumming course not only was the course great but the tools provided for self-development are excellent and empowering. I’d never done journeying before and because I don’t normally see anything I wondered how I’d find it. I believe because I was ready for this next part of my development I got some amazing experiences with my journeys. The first day was really good preparation for the second day as everything just all fell into place. Like I said on the course this really was literally the end of one year and starting fresh on my birthday with a new and improved understanding. These insights have enabled me to combine my practices together and find how they are connected in my development. Now, I am addicted to the drum, I love it. I start the day with honouring the 7 sacred directions, mantra meditation and a dash of reiki – a fantastic morning energizer / refresher. I even drum before I go to sleep in the evening. Since the course I have confidently journeyed regularly on my own and re-visited my guides / power animal to gain further insight and guidance on how I should direct my spiritual development. “I wanted to enhance my healing work and to work with my shaman guide who is amazing and it was this wonderful man that guided me to Cathy’s Reiki Drum course. I loved the course and it was so empowering too. The part I enjoyed the most was taking the client on a journey with the drum and working with the mantras too, although I loved every part of it really. I thought the timing and flow worked out really well. There was no time wasting and it was put together in a very positive way. I felt the cost was fine and good value, also the group was a perfect size and lovely people. The venue was lovely, homely and very welcoming with a great energy and the training manual was very informative. “My goals by taking on this training course where to learn another aspect of Reiki and more spiritual learning. Also give me more confidence in performing Reiki on others and a deeper understanding of drumming. I have learnt so much and mostly about myself. This has increased my confidence tenfold. I enjoyed all aspects of the course! Cathy, my new drumming friends, everything I learnt, My drum, The food, The location. Driving through Whipsnade – the views. The weather. It was all lovely. I liked the way the course flowed. Never bored. Full of content but really relaxed and never rushed. It was beneficial to have a break between the 1st and 2nd day although I felt I wanted more! Will be lost this weekend without a whole day of drumming. The size of the group was perfect and the atmosphere was lovely and welcoming – Garden, house, parking all good. The content of the training manual was very good. Receiving it in advance gave us time to read through a couple of times to familiarize ourselves with the techniques. Cathy was so reassuring as I doubted my experience requirements and she was lovely throughout very approachable via email and in person. Glad to have been taught by such a lovely lady. “I was drawn to take this Reiki Drum course since it appeared on the Reiki Evolution site. I was so pleased when the dates were put up and I was able to make both days – a first for me, not having something else booked! 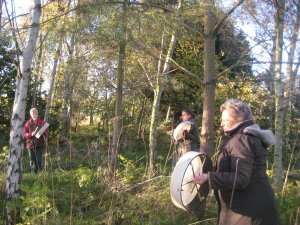 The course has very much satisfied my interests in Reiki Drumming and has made me want to look further at Shamanic ways too – some which I already use and hadn’t realised. The best part for me was the journey to find your voice. It was brilliant, emotional, unexpected and healing all in one. Everything flowed together perfectly over the two days and I thought it was beneficial to do the course with a break in between as it allowed practise. It was very good value – I’d have paid more, as it’s something I really wanted to do. I thought the facilities where great, everything was perfect. The Training manual was very informative, gave me a chance to read through what we would be doing on the course and become familiar with it before attending, which in my opinion means you get lots more from the course. I feel I received good support before, during and after my training. 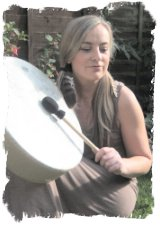 “I wanted to work with Sound for healing and had been drumming for a year in a chanting circle so when I discovered there was such a course in ‘Reiki Drumming’ I was drawn to it. I loved the drum circles we had all together. I felt the balance throughout the course was perfect and I was most impressed at how we fitted everything in without feeling rushed and completed the 2 days at the appointed time. Very well done Cathy! “The course helped me so much! I feel this has cemented the healing process I began in Reiki 1 and 2, as well as giving a whole other level to my healing work. I really feel it’s what I’ve been waiting for in order to work properly in Reiki. 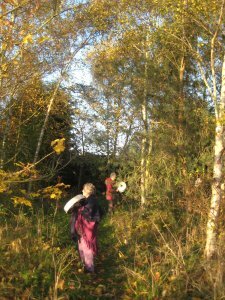 “The group drumming session on Sunday morning after the seven sacred directions was what I enjoyed the most – and thank you again for doing that for my birthday x The course is very good value. Absolutely wonderful setting – would have liked to have stayed in the yurt overnight! Perfect manual – didn’t need to add anything to it, very clear and detailed & support received was just right. “Great organisation and pre-course information, preparation and care, lovely venue, lovely people, really well planned and thought out course, beautifully held space with love, brilliantly led by Cathy. I felt Cathy was extremely knowledgeable in all aspects of the course and more, and was very open and available to questions at all times.